The Ice Master clears hard ice and frost and cracks thicker ice. Four blade positions allow the Ice Master to perform in the worst icy conditions. The blades lock in three different ice-scraping positions, and the ice-breaking teeth provide the fourth ice removal option. Clear away frost twice as fast! The two brass blades clear more surface area when used in a back and forth motion. A single pass over the glass is like two passes in effect, so you’re clearing more frost without actually doing more work. For the purists, the dual blades can be locked in the forward position to work as a conventional ice scraper. 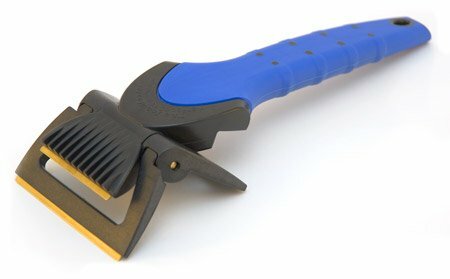 This configuration creates a stiffer blade for scraping heavier ice and increases the reach of the scraper. The stationary center blade is highly effective on hard ice and rear-view mirrors. Use it to clear hard ice after cracking it with the plastic teeth. Tough polycarbonate teeth on the backside of the center blade allow you to crack thicker ice so you can then clear it off the glass. The Ice Master is made of tough polycarbonate with softened brass blades and a rubberized handle. You’ll use your Ice Master month after month, winter after winter. 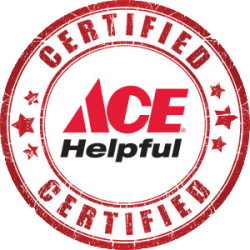 The Ice Master comes with a 1 year warranty against manufacturing defects.